For Programmers, Syntax highlighting Feature is plus point in writing programming code's fastly. Syntax highlighting Feature In text Editor, Helps Programmer To Write Programming Syntax Correctly By highlighting programming syntax, comments, functions, class in various Colours. So, Today In this post, i am going to show you how to make complete set of functions that can highlight programming syntax, comments, strings, class, functions and other things in various colours. 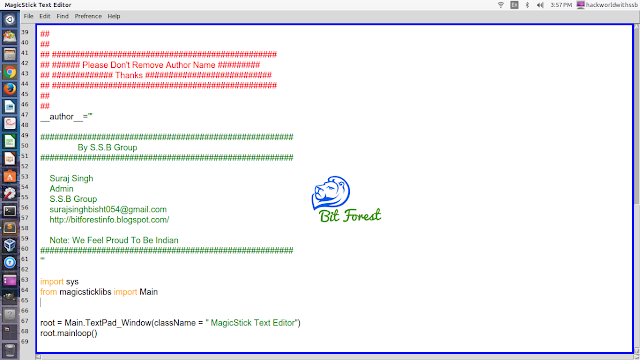 Friends, This Is our last Tutorial Of Python MagicStick Project But, if you are a new visitor, Then I will suggest you to read our tutorials number wise. because in these tutorial series i am showing how to use python tkinter module to create a real life application. Or You Can Also Download Our Example Codes Of Python MagicStick Text Editor Project For Understanding This Project More Clearly. For this purpose we will use re module. The re module is one of the best module in python for finding any text data in fastest way. This Module provide us special abilities and features for finding any specified data, line, word or content from raw data. So, with the help of re module, we will identity our programming syntax, function and other things. If you don't know about re module. And To make this script easy to understand we will create a separate empty script "ColorLight.py" in "magicsticklibs/" folder and write our codes in it. Friends, here for tutorial purpose, i am writing this function for highlighting python related syntax only, but with the help of re tutorial, you can modify these code's according to your needs. So, let's do some practical coding's. return "(?P&lt;%s>" % name + "|".join(alternates) + ")"
kw = r"\b" + any("KEYWORD", keyword.kwlist) + r"\b"
builtin = r"([^. '\"\\#]\b|^)" + any("BUILTIN", builtinlist) + r"\b"
sqstring = stringprefix + r"'[^'\\\n]*(\\.[^'\\\n]*)*'?" sq3string = stringprefix + r"'''[^'\\]*((\\.|'(?!''))[^'\\]*)*(''')?" Place "ColorLight.py" In Our "MagicStick/magicsticklibs" Project Directory. Add "ColorLight.py" Function in Our "ConfigSettings.py" because in this project, "ConfigSettings.py" is responsible for joining libs in main stream. Boom! Our ColorLight.py script is now ready to use and also, this script is now connected with MagicStick Project Main stream. To run this script in main stream of project. just run "main.py" script or you can also run this script alone and parallel without touching project main stream just run "ColorLight.py".